Working with the assistance of Randy’s mother Delores and brother Kelle, Marshall finally gained access to Rhoads’ legendary white Marshall amp head. 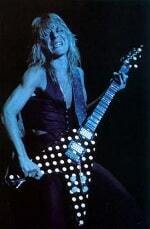 Marshall investigated every minute detail, including the cascaded input modification that was performed at the Marshall factory in 1980 when Rhoads custom-ordered two white Marshall stacks. 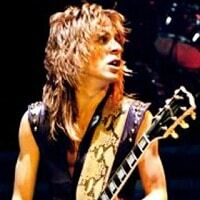 As a result Marshall just released the limited-edition 1959RR Randy Rhoads Signature Series Super Lead 100-Watt head, an exact duplicate of the 1980 Marshall JMP 1959 Super Lead MKII 100-watt head that Randy used onstage with Ozzy and on the recordings of Blizzard of Ozz and Diary of a Madman. 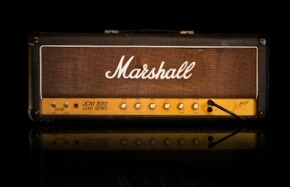 ALTHOUGH MARSHALL HAD been making amps with master volume controls since 1975, Rhoads preferred the original Non-Master 100-watt 1959 Super Lead model with four inputs, which Marshall made until 1981, when it was replaced by the 1959 JCM800. The 1959RR is a two-channel 100-watt head powered by a quartet of EL34 tubes (just like Randy’s U.K.-built original) with volume controls for each channel and a single set of presence, treble, mid and bass controls shared by both channels. The modification cascades both halves of the first ECC83 tube (a.k.a., 12AX7) in the preamp circuit, feeding the output from the first stage into the second stage’s input instead of using each half separately as an input buffer for each channel. This allows the volume I knob to function like a master volume while the volume II knob operates like gain control when a guitar is plugged into the channel II inputs, producing much more preamp gain and saturated distortion than a stock 1959 Super Lead head. If you prefer the stock Super Lead sound, plug into the channel I inputs, which aren’t affected by the cascade modification. Like an original 1959 Super Lead head, the 1959RR’s rear panel is about as sparse at it gets. There are two speaker output jacks, an output impedance selector switch with 4-, 8- and 16-ohm settings and a mains selector switch that lets you select 120 volts (U.S.) or 220 volts (U.K., Europe) input voltage. With its white “elephant” vinyl covering, black Marshall logo, white piping and black corner protectors, the 1959RR looks almost identical to Randy’s original amp as well. The only details missing are the ring from a can of Coke that Randy set on the amp, a few stray pieces of duct tape and general wear and tear. RANDY’S ORIGINAL MARSHALL 4×12 cabinets were loaded with 100-watt Altec Lansing 417-8H speakers, which are no longer made and are very hard to find. Instead, I tested the 1959RR through a Marshall 4×12 loaded with G12T75 speakers, which provides similar resistance to speaker distortion and retains tight, focused sound at high volume levels. I also broke out my original 1981 MXR Distortion+ and vintage Seventies Cry Baby wah pedal to duplicate the primary tone-shaping elements of Randy’s custom pedal board. Test guitars included a Les Paul Custom with stock Gibson humbuckers and a Seventies Ibanez Rocket Roll Sr. with vintage DiMarzio Super Distortion humbuckers. 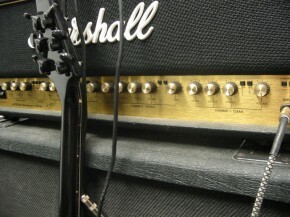 Like most non-master 100-watt Marshalls, the 1959RR head is very loud, even at the lowest possible volume setting. Channel II is especially over the top, and by the time you dial in the sweet spot, around 6, its loud enough to kill small birds, the elderly and sensitive squirrels. Unless you’re playing the Forum, you’ll need an attenuator like the THD Hot Plate to enjoy this amp at more-civilized volume levels. I achieved the most accurate duplications of Randy’s Blizzard rhythm tones on channel II with both volume controls dialed to 6, the bass turned down, the midrange cranked tip and the treble and presence tweaked about midway to provide the right amount of sizzle. The outstanding manual, writ- ten by GW contributor Nick Bowcott, shows a similar setting that Randy apparently preferred. Randy’s Diary lead tones emerged both through channel I using a combination of the Distortion+ and wah pedals to duplicate his boxy midrange and through channel II using just the wah. The cascaded gain mod produces lively “crushed glass” distortion with sparkling treble harmonics—an elusive but highly desirable classic Marshall tone. The Distortion+ really isn’t necessary on the channel II inputs as the cascade mod provides all the gain and gnarly crunch you could want for classic Eighties metal tones.